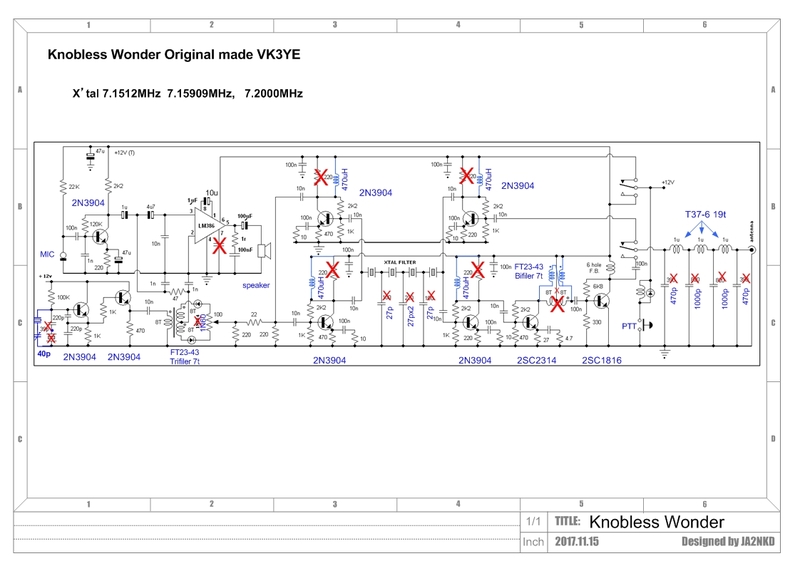 I made "Knobless Wonder" which was introduced in the new QRP Plaza. This transceiver is a super simple SSB transceiver designed by Mr. VK3YE Peter parker famous for QRP. Mr. is making a variety of QRP equipment such as PSN, it is a very challenging Ham. I sometimes refer but I have very useful information, so why do not you look at it once. 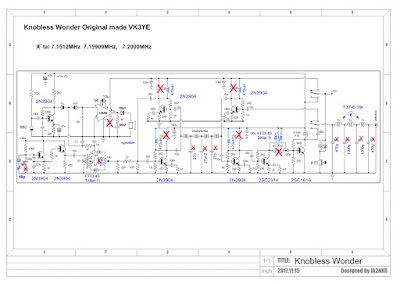 "Knobless Wonder" has no knob like its name. There are only antenna connectors and microphone jacks. With its ultimate simplicity, you can feel good with this thorough thinking. Of course the circuit is simple. Carrier oscillation, balanced modulator, and transmitted and received through a X'tal filter. There is LPF in TOP. Transmission and receive are byteral , and switching antenna and power supply with one two-pole relay. receive is ANT-RF amplifier - X'tal filter - Amplifier - Balanced demodulator - AF amplifier (LM 386). Transmission is microphone amplifier - balanced modulator - RF amplifier - X'tal filter - RF amplifier - driver amplifier - final amplifier. It is a direct transmit / receive SSB transceiver. I wonder if QSO can be done with this. It is fun after making it. JA 2 GQP, JH 8 SST, Mr.K and his authorities started making challenges with friends. Since the filter frequency is the transmission / receive frequency, procurement of crystals is an issue. Several candidates are also introduced in Plaza. This time we used Sato Electric's 7.15122 MHz. 1 for carrier oscillation and 4 for filter. I used transistor 2N3904 which it sells in autumn. This transistor is really powerful and can be used without problem if it is HF. Anyway 20 pieces 100 yen and cheap. Driver used 2SC 2314 QSY from Mr. GQP and 2SC1816 in the final, for CB. For other circuits, I think that you can easily understand by referring to the circuit diagram. To change from the current design, change the transistor load resistance (220 Ω) to 470 μF RFC. X'tal filter, LPF coil, condenser was reviewed. As a result, reception sensitivity was improved and output was improved. The transmission output reached a peak of 3 W. It seems that cross modulation will occur if the reception is too high. I used a board made by Sunhayato ICB-93 SEG mesh shield. Since one side is a ground pattern, stable operation can be expected at high frequencies. For the speaker and the microphone, we tried miniaturization by using the speaker microphone for the handy transceiver. After completion, I tried the super super local JN1VBN station and test QSO. There was no problem with the transmitted sound and it was a report that the modulation was beautifully applied. As for receive, the VBN station was strong, so distortion was felt with a slight oscillation. A little constant review may be necessary here. However, enough readability was obtained. I modified the circuit diagram. Change around the LM 386 and the 2N3904 load R of the RX top to L and increase the sensitivity.